I was going to start out with a marine-inspired rendition of America the Beautiful but I think the pun is already clear. So I will begin instead with this map of Port Aransas, courtesy of Google maps. Also for your reference, marked in bright blue, is the direction of the open ocean. The dark greenish blue area shown on the map is part of the estuary ecosystem. What makes the area shown so different from the ocean that it gets its own name? Estuaries are a unique middle ground between river and marine ecosystems. As defined clearly by NOAA, an estuary is where fresh and saltwater mix. Estuaries are home to a wide range of interesting species, due to the low energy of the system and the uniquely brackish water. 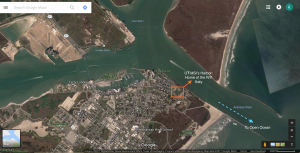 In Port Aransas, the estuary ecosystem is formed by two major rivers—the Aransas River and the Mission River—hitting the ocean. We explored differences between this ecosystem and the more typical marine ecosystem while aboard the research vessel Katy. An estuary is composed of many different zones, with the end of the river called the head of the estuary, and the end just before the ocean called the mouth. The conditions between these two regions are diverse, with a significantgradient of salinity levels and variable water speeds. Estuary areas are often in protected bays or inlets, and as such water speeds are relatively slow. Similar to the water salinity gradient, there is also a gradient in the amount of ground cover over the range of an estuary system. At the estuary head, larger pebbles and stone from the riverbed tend to make up most of the ground cover. As this sediment gets pushed along with the current and weathered, it gradually becomes smaller and smaller particles increasing the turbidity of the water (amount of suspended solids) and forming the mud that we pulled up during our mud grab on the R/V Katy. This high turbidity and loose muddy bottom limits organisms that need a sturdy base to grow on, but makes the perfect home for the worms, crabs and brittle stars we found in our sample. As you move towards the mouth of the estuary, you approach the sandy or rocky bottom typical of an ocean floor. The species that live in an estuary are specifically adapted to the variable salinity waters and the high volume of suspended solids. While there are not as many species adapted for this as opposed to straight freshwater or marine systems, estuaries do play an important role in biodiversity—they are home to a lot of young species. There are many species that lay eggs in freshwater but live in saltwater, and vice versa. Estuaries serve as an important transition zone between these two parts of an organism’s life. Many of the fish species we pulled up in our trawlin the estuary area were smaller and younger fish, including a baby squid. The instructors said it is also common to pull up baby crabs or other young marine species. Estuaries are often protected areas to ensure the safety of the unique flora and fauna and to monitor water quality. The Mission-Aransas National Estuarine Research Reserve is a great place to learn more about this unique ecosystem and how it is being protected. …. To Barton Springs we go! For our first of many field trips this summer, our REU group visited Barton Springs, a natural groundwater fed pool in the city of Austin. This is a prime spot of interest for those looking to escape the heat of the day as the pool’s water is around 68°F yearlong. However, we weren’t there just to swim. 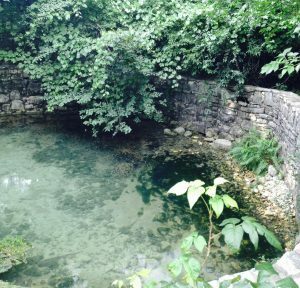 Barton Springs is an interesting case study in biodiversity and climate effects on a karst (characterized by a lot of limestone) region. Through this trip we explored both of these aspects in person. Curious to learn more? Prior to the trip we read these three articles on the Barton Springs area and some of the issues impacting it. 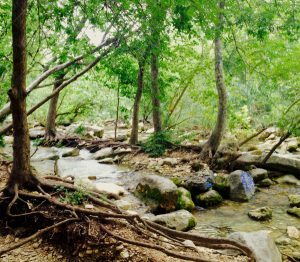 After arriving in the Barton Springs complex, we hiked along the greenbelt trail to the upper springs area to explore the geologic formations in a karst region. We then went to the Old Mill Spring on the other side of the complex to discuss biodiversity. The final exploration of the day was a comparison between the surface water in the springs area, as compared to the groundwater in the Barton Springs Pool. 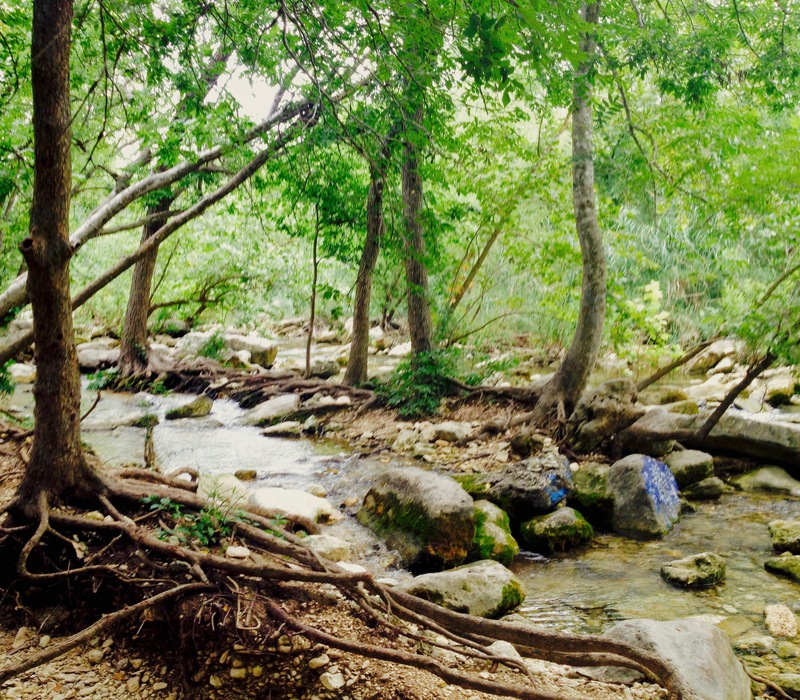 The four springs in the Barton Springs Complex act as the discharge points for water from the Edwards Aquifer. These springs are part of an artesian system which means the water is under high pressure, causing its discharge to be seen at the surface in the form of a spring. There are three important features that make up this unique ecosystem, the karst nature of the site, the wide biodiversity, and the springs themselves. While many karst regions do tend to be characterized by the presence of limestone, it is more correctly defined as a landscape formed by a dissolution of soluble rock material such as limestone or gypsum. 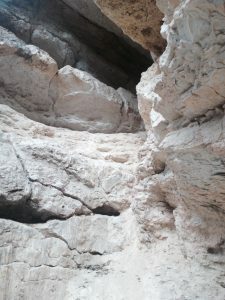 At the end of our hike along the greenbelt, we crossed the creek and arrived at an area of exposed limestone from which we could examine the material that characterized this region and also to explore the rock layers in the nearby Campbell’s Hole Outcrop. One of the defining features of this outcrop— besides the easily differentiated layers—is the noticeable fault line. After our exploration of the rock layers and material, we hiked a little ways up the cliff front to the exposed fault line which is shown in the picture I took on the right. Drought and wet conditions are especially impactful in karst regions because an increase in surface water can rapidly affect the groundwater quality because of the easily soluble nature of the rocks. Spring flow and groundwater levels can change rapidly in a short amount of time in these regions, and thus they are more susceptible to climate change. 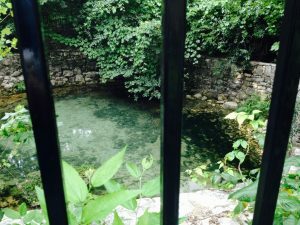 There are four springs in the Barton Springs complex: Old Mill Spring, Eliza Spring, and Upper and Main Barton Springs. These streams are connected by an intricate network of dams and other structures. It is difficult to describe the exact nature of this system from a single visit, but I think this description from edwardsaquifer.net does a great job. As a part of our field trip, we visited Old Mill Spring which is now closed to the public as can be seen by the bars in the photo on the right below. This space, along with Eliza Springs, are being preserved for their historical value but are also being reserved as habitat for the diverse range of species that take residence in the springs. The unique nature of the spring ecosystem makes it an ideal home for a wide range of species. Two species of concern are the Barton Springs Salamander and the Austin Blind Salamander, which are both federally listed endangered species. This spring complex is the only known home for these two salamanders, and dams and other uses of the springs have greatly reduced their numbers. As mentioned above, Old Mill Spring and Eliza Spring are being reserved as habitat for these and other species. Overall, I would deem this a very successful field trip with interesting ties to the project I am working on this summer. My research looks at modeling non-residential indoor water demand in Austin. So it was very fascinating to explore Barton Springs, particularly in regard to the recreational water demand aspect to see how that use compares to the usage I am tracking in my research. Many of the patterns experienced by the springs during drought and wet conditions can be similarly modeled to match indoor water demand and usage over those same time periods, especially for irrigation. I highly recommend visiting Barton Springs, both to swim in the cold groundwaters of the pool and to have a chance to experience all that this unique ecosystem has to offer. I trekked across campus, and the humid heat was waiting like a welcoming party. This was the first voyage in one long summer journey. I had little idea of what to expect, as we were not provided with much in the way of a schedule. I knew that orientation was the following morning, so I took it one step at a time. In the case of walking across a campus littered with steps, that was a quite literal decision. Right off, I noticed several things about the campus. The first was the creek running through it. 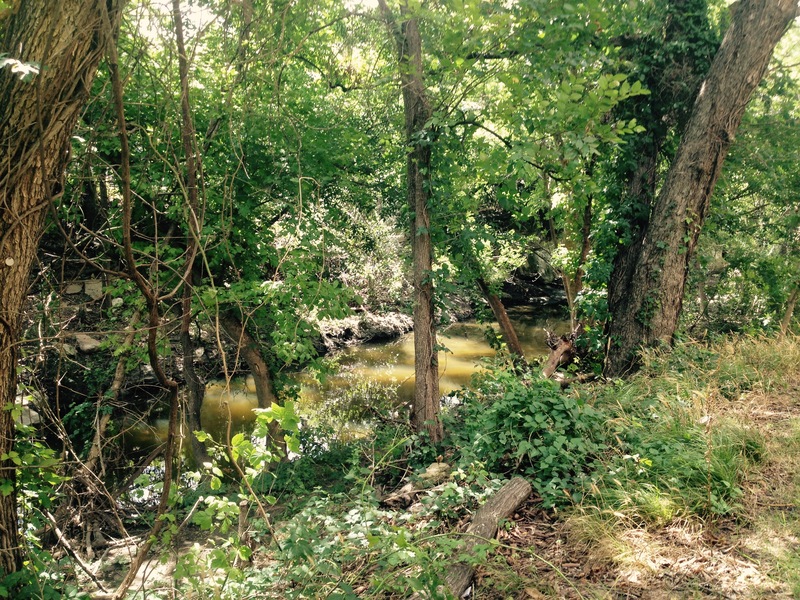 Waller Creek flows through campus and downtown Austin, eventually dumping into Lady Bird Lake. As it runs through campus, this thin creek is sandwiched between a highly trafficked road and the rest of campus. 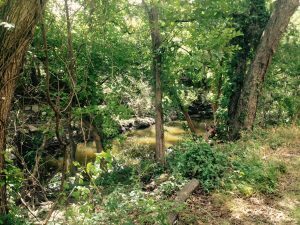 There are limited places for people to enjoy the creek beyond the bridges traveling over it, and certain areas may be in need of restoration; but there are currently several initiatives on the UT Campus and throughout Austin aiming to revitalize the creek area. Second, was the consistent labelling of recycling, trash, and compost bins around campus. Recycling and composting is something that many people struggle with at my home, Emory University, because it looks slightly different in every building. 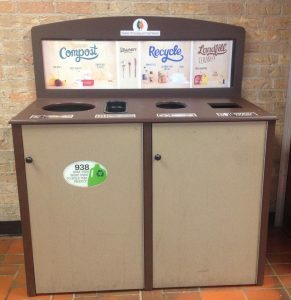 While UT Austin does not have composting bins in the residence halls or around campus, there is a large composting program in the dining halls. 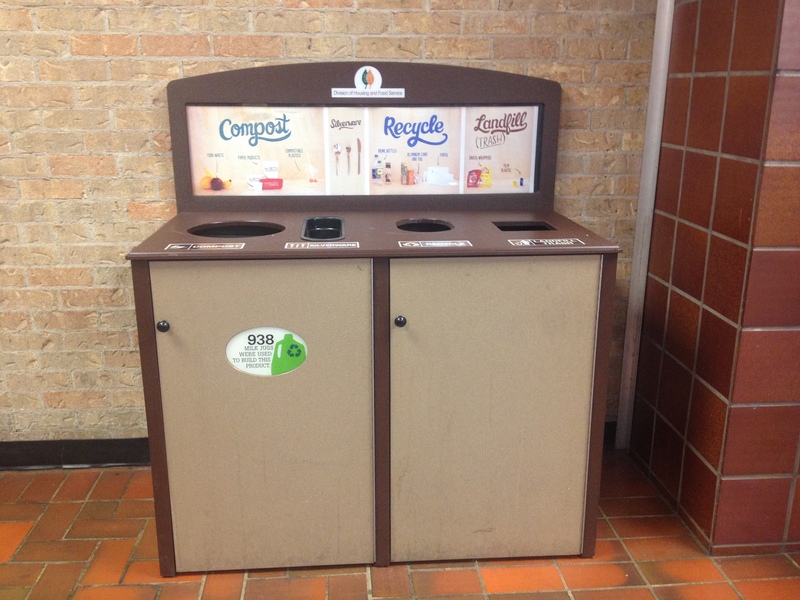 The same bins are used consistently across campus making composting and recycling simpler for residents, faculty, staff, and other university visitors, which helps to improve the success of a recycling program. Now, if only UT Austin’s success with labelling carried over to the buildings on campus, most of which are minimally or completely unlabeled. It makes trying to find your way around campus quite an adventure. My third observation was of course the construction- no stranger to me considering the new dining facility being constructed at Emory. As my time here continues, I will do some spotlight posts on a few places of interest around campus. Keep an eye out!